About Karuizawa | Karuizawa is a resort near Tokyo or Karuizawa. Karuizawa is perhaps the most famous for its history with the post, which would be transported down Nakasendo Way on its journey from Tokyo to Kyoto. It’s an important transportation route that people have loved for many generations. It became famous as a villa area when a missionary named Alexander Croft Shaw, who was born in Canada in 1886, visited Karuizawa. He was impressed by its beautiful nature and comfortable climate, and introduced it to the world as a summer retreat. Since then, many missionaries and their families began living in Karuizawa and it became a town with a strong Christian atmosphere, with many churches and western style buildings being constructed. They asked the residents to be punctual, keep their promises, not to lie and to simplify their life styles to make Karuizawa a bright, clean and cozy town. This is the essence of today’s Karuizawa Charter that adheres to the traditions and history of Karuizawa. Furthermore, they taught the local famers how to grow highland vegetables such as cabbages that are suitable for the climate of Karuizawa. These are now the famous local products of Karuizawa. As for the environment, about half of Karuizawa is inside the national/quasi-national park that has been making efforts to preserve the nature that creates the contrasting scenery in every season, with the grand Mt. Asama as the centre. Thanks to its coziness and the famous authors and artists who have visited and stayed in Karuizawa, it has now developed into a town of great art and culture. Karuizawa offers many charms, not only as a summer retreat but also as a spot to visit during winter. There are many people who enjoy winter sports such as ice skating, skiing, snowboarding and curling. In fact, the Nagano Olympic Games in 1998 were held in Karuizawa. The number of leisure activities including cycling, horse riding, tennis and golf has been increasing in recent years, which has transformed Karuizawa into a bit of a sports town. Karuizawa has strong ties with the Imperial family, who have used this place for their summer retreats, for rest and for building their villas. Residents of Karuizawa are proud and pleased of the deep, continued bond between their town and the Imperial family and value their visits immensely. 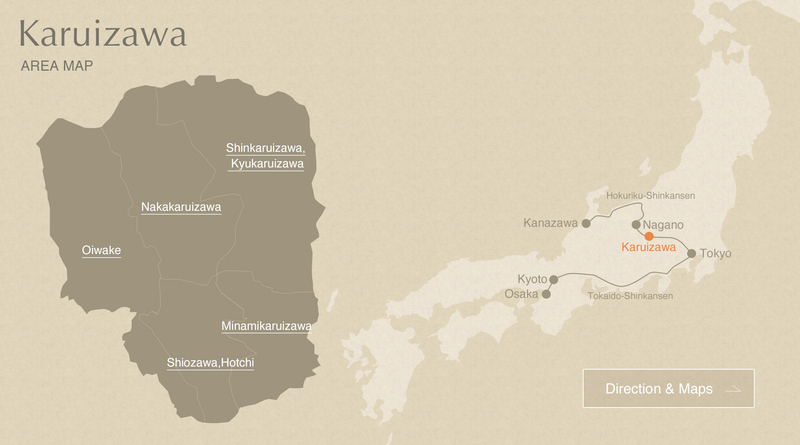 This website separates Karuizawa into five different areas: Oiwake, Shiozawa&Hotchi, Minamikaruizawa, Shinkarauizawa,Kyukaruizawa and Nakakaruizawa. Each area has its own unique characteristics and attractions. Just an hour away from Tokyo by JR’s shinkansen, Karuizawa is situated in the central area of Japan and belongs to the Saku region. It is a highland full of exquisite nature and surrounded by beautiful mountains. The population of Karuizawa is less than 20,000 but the place is kept busy with the 8,500,000 tourists who visit annually. The area of Karuizawa is about 156.03 km². Karuizawa is a highland located at the altitude of 1,000 metres. Mt. Asama is 2,568 metres high and the altitude of Karuizawa Station is about 940 metres. Since Karuizawa is located at a high altitude (about 1,000 metres), it has the climate typical of a highland summer retreat, with a cold winter and a cool summer. During winter, the temperature drops lower than - 15°C.